Few days back one of my friend sent me an audio message in Facebook messenger, the moment I was realized that I haven’t covered this audio recording system on 9lessons.info. Today I want to discuss how to publish a voice recording messages on newsfeed using Jquery and HTML5 with custom HTML5 audio player. Take a quick look at the live demo, make sure use the microphone for better result. Newsfeed table contains all the user update details. HTML code for custom designed audio player, here the actual HTML5 player is in hidden mode. Number 10 refers to user's session id. Focus on colored CSS properties. 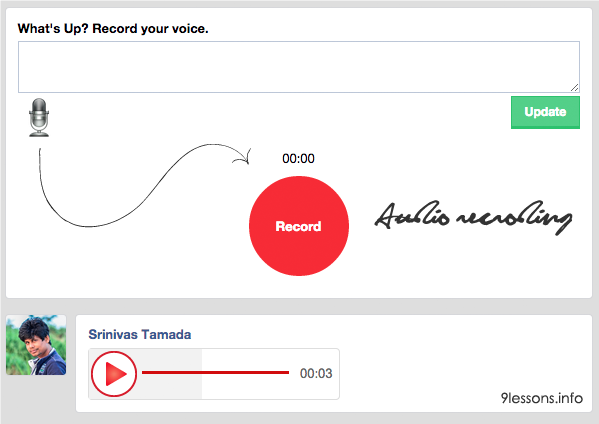 This script calls record.js for recording the audio. Modified and included following code in record.js for storing the audio data in Base64 format. Inserting the audio Base64 data into newsfeed along with user session id. This way data will store audio data into newsfeed table. Database connection you have to modify username, password and database values. on pc it works good but on my smartphone when i click on "record" give me the copy & paste function.... how can i disable it??? Great, but don't is working for me, on localhost and on server the time is always zero. Fantastic! The possibilities are endless. Good job! Am your ardent follower from Nigeria. you are great. thank you for your tutor, i will use it. Such an awesome thing!! I would wish to try it.. Great tutorials! I need help for installation. anyone to help me? Its great that you also maintain mysqli extension in all your latest post. What about webcam video recording ? The resulting mp3 recording will be longer by aproximetely 50%. So a 5 seconds recording will have a 10 seconds duration, with the last 5 seconds being empty. This may be caused by a buffer problem. We get a loud mic record when we enable mic support. Download não funciona....só subscribe ao feed burner. can someone add this to my wall script v7 please? Great Idea very Informative for me, Thanks for Nice tutorial. its good script.I want to hidden voice record on my own website. can it be possible? i've subscribe but still can't download, why? i've verified my email and still can't download please help me. Great idea, but on smartphones dont working. it working but not work properly way. getUserMedia() no longer works on insecure origins. To use this feature, you should consider switching your application to a secure origin, such as HTTPS. no funciona el boton update no muestra el texto junto la grabacion...y no muestra las gabaciones de la base de datos se borran al refrescar la pagina....hay errores en el scrip o asi es? The demo is not working on my pc safari how to working on my pc safari ?????? Author please update the project, base64 audio is not playing when I am trying to play by html audio tag. Demo seems to be working for me on Chrome.